There is passionate interest in the election on the part of our Italian friends. 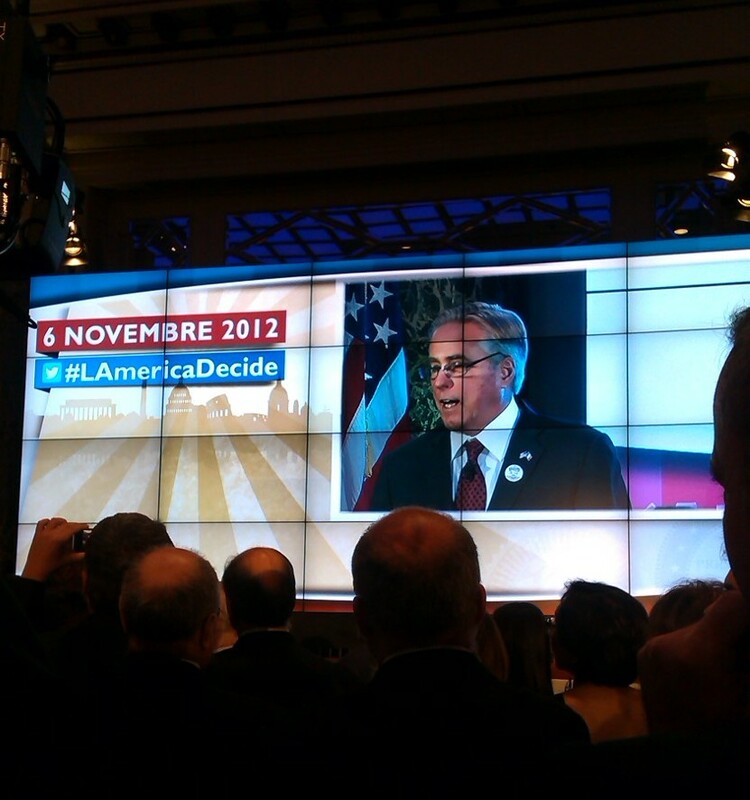 Had Italy voted, I daresay the popular vote would be for President Obama. The event started at 22:00 and by 23:00 there were about 2000 people in attendance. There a was Tex-Mex buffet (yum! ), trays of donuts were passed by tuxedo-clad waiters, wine flowed freely, and I was almost trampled in the rush of people clambering for the 1000 hamburgers MacDonalds delivered. (All donations, my tax-paying friends. The U.S. Government does not foot the bill.) Here are a few shots taken with my phone. Ambassador Thorne addresses the jubilant crowd. Election results were broadcast throughout the venue. 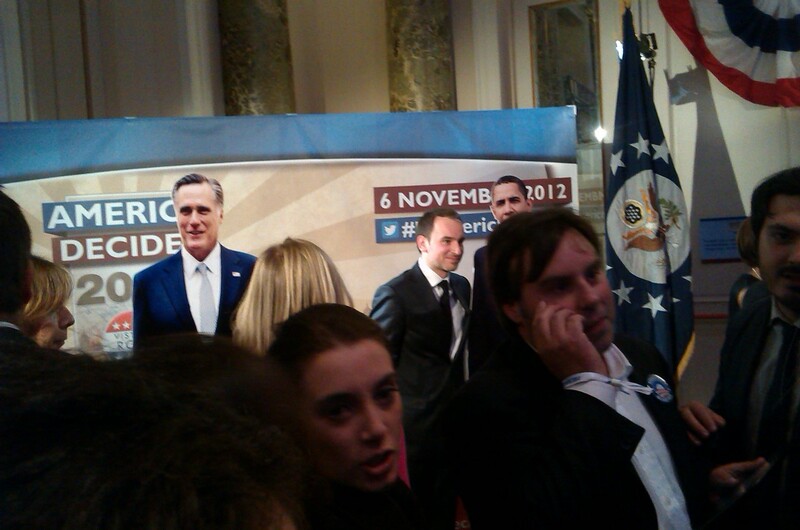 Mr. Romney stands alone as Mr. Obama attracts a fan. 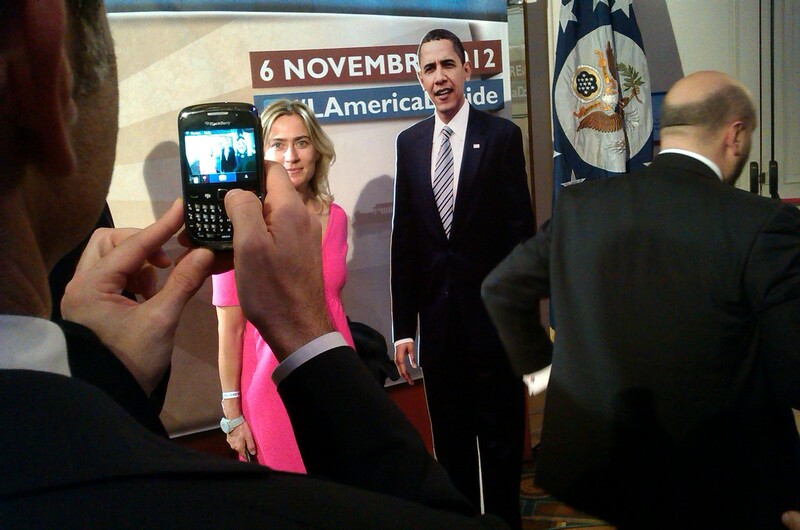 An attendee strikes a pose with Mr. Obama’s cut-out. What an opportunity this was! I voted by mail weeks ago and was able to celebrate the American democratic process in a way I never have in the U.S. So happy you had this opportunity, Laurel. One you will remember forever. I have never been in a foreign country on election night. During my tours in D.C. did get to experience all the excitement first hand of Inauguration festivities several times. That was very exciting for me. We were in Buenos Aires on election night four years ago. We were so excited to wake up the following morning to find Obama won the election. In the breakfast room, there was a huge picture of Obama on the front of the Buenos Aires newspaper. I was in Barcelona when Obama was elected 4 years ago. The bartenders, hotel front desk people in little towns, students on the street, everyone was interested in our election. Obama made the front pages of all the papers the day he won. It’s amazing watching another country being so happy about the US president.